A FUN CHAT WITH OUR VERY OWN KERRI MERMAID ABOUT HER NEW ROMANTIC COMEDY, OUT TODAY … READ MORE ABOUT IT AND GET YOURS HERE! Carlene Mermaid: Miss Sparkle Pants, firstly Happy Book Release day! 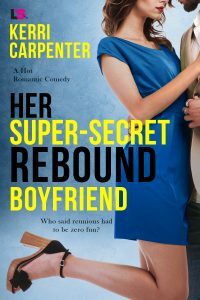 The cover is fantastic and I’m so happy the world gets to enjoy Her Super-Secret Rebound Boyfriend for themselves! Secondly, you have emerged as a fresh and fabulous voice in writing stories with really fun and intriguing romance secrets. You did the amazing three book series about the mysterious Bayside Blogger and now this new book which brings the hero and heroine together via some really juicy … secrets! So I have to ask, what is it you love so much about the written secret?